This is one of our newest service and one that keeps us in the forefront of conference service solutions. What exactly is a digital poster? In concept it is much like a conventional paper poster, except that you display it in on a large screen HDTV rather than a poster board. Instead of walking through a large hall full of poster boards, the viewer simply stands in front of the screen, and uses a mouse driven search and menu system to find and view the posters. You can put them on a website so everyone can view it. What happens with paper posters after a conference? Most go into the garbage or sit in a corner roled up in a tube. It results in better science, and a more interesting conference, by elevating the poster into something more interesting and dynamic, and a more integral part of the program. Let us show you how. 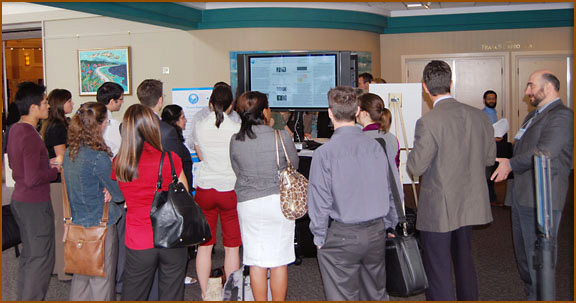 Delegates cluster around a poster station while author makes presentation.